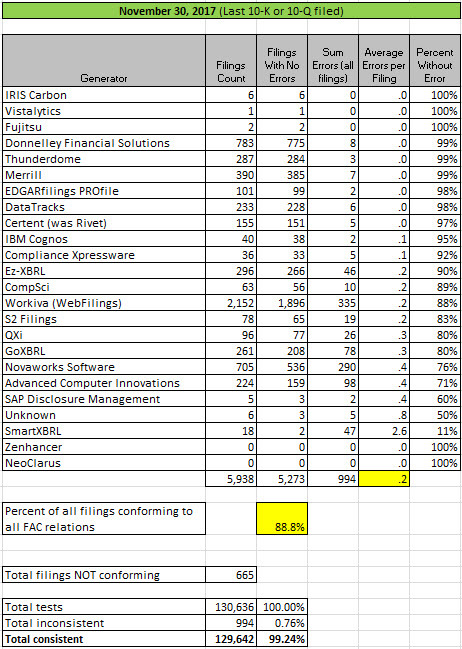 The graphic below shows the results of my quarterly measurements of fundamental accounting concept relations continuity cross checks of XBRL-based financial reports of public companies which are submitted to the SEC. 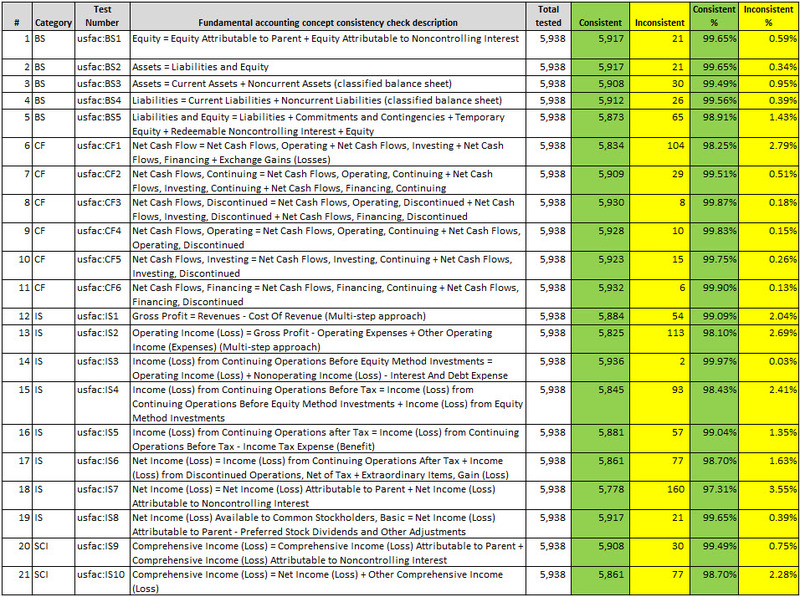 I have been measuring specific fundamental accounting information of public company XBRL-based financial reports being submitted to the SEC for going on four years now. The quality of the information reported continually improves each time measurements are taken, which is a good sign. Highlights for this quarter include three new filing agents/software vendors that have reached the point where 90% or more of the XBRL-based reports they create are consistent with all of my business rules: Compliance Xpressware, EZ-XBRL, and IRIS Carbon. You can download a ZIP file that contains an Excel spreadsheet that a list of all 994 errors. Here is a comparison of March, August, and November 2017. Previous fundamental accounting concept relations consistency results reported: August 31, 2017; May 31, 2017; March 31, 2017; November 28, 2016; August 31, 2016; June 30, 2016; March 31, 2016; February 29, 2016; January 31, 2016; December 31, 3015; November 30, 2015; October 31, 2015; September 30, 2015; August 31, 2015; July 31, 2015; June 30, 2015; May 29, 2015; April 1, 2015; November 29, 2014.